Like a light breeze on a hot day, just looking at the sparkling blue of this Aquamarine gemstone might make you feel cooler. Well, if not cooler, then at least happy! The blue color is dazzling and beautifully clear. The stone is 10x5mm and 1.07 carats in a marquise cut. There's just something elegant about this color and cut so I tried to make a band with the same feel. The Sterling Silver band is handmade. Many small pieces went together, one piece at a time, to build this ring. While I can make something similar, all those tiny hand shaped pieces, ensure that this is a one of a kind ring. I set the gemstone low on the band so that it would be easy to wear. 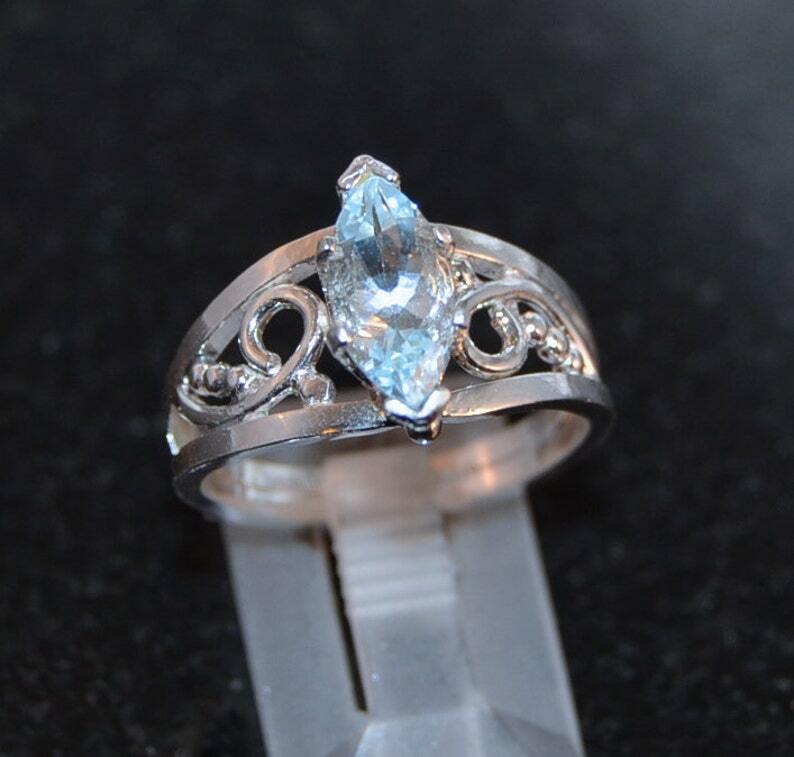 On each side of the Aquamarine, you will find a curl and tiny silver balls. The split band comes together on the palm side of the ring. Overall, the band is about 9mm wide near the stone and then tapers down to about 2.5mm. Life is too short to wear ordinary jewelry! This ring is generous size 6.